I have to admit that during the holiday break, I couldn't stay away from 3D software. I also found that as I would navigate through 3D space, my left hand would naturally reach for my Space Navigator that wasn't even there. That's when I realized that I really did use this thing. So now I'm convinced that the Space Navigator is a must have. Well 3Dconnexion late last year released their newest product, the SpaceMouse Pro. It's a hybrid between the SpacePilot Pro and the SpaceExplorer. After giving it a test drive for several weeks, I have to admit it really is their best product yet. Not only is it sleek looking, but it has just the right buttons that need to be used and no more than that. Probably the most distinguishing buttons that the SpaceMouse Pro has are the large buttons on top. I found these to be really useful for setting up tools that I use often in SketchUp & 3ds Max. The great thing about assigning your regular tools to these buttons, is once they're assigned, you can remove them from your menu bars and free up even more space in your viewport. I'm using SketchUp as my example, but this applies to any software. In SU, I assigned 1,2,3,4 to my visual styles toolbar. These are styles that I switch between alot during modeling, and now that they're assigned to these buttons, I can simply remove the tools from my palette. What's even better is they're positioned right where I need them as I'm navigating so I don't have to take my hand off the navigator itself. Another toolbar in SU that I constantly use are Views buttons to jump to my top, front, right, left, etc. Now instead of needing the toolbar on, or even keyboard shortcuts, this mouse has these buttons built right in. I guess the designers knew that 3D artists use these views alot for editing models and figured to add them in. Of course if you want to customize these buttons, the software with the driver allows you to change the buttons to any function you want. Along with the views button is the addition of some other frequent buttons used to navigate in 3D, such as shift, ctrl, alt, and esc. It might be genius, because adding these buttons next to the navigator can almost mean never letting go of the navigator in SU when inference snapping a line to lock to an axis even during a pan! Lastly, the SpaceMouse Pro has a Fit button, that zooms into objects visible in your scene. Which is very handy, and allows you to do this, again, without leaving the Navigator. 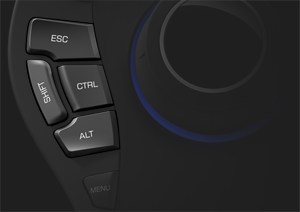 Really all of these buttons could be used on the keyboard as shortcuts, but the beauty about having them around the orbiter is that you don't have to lift your left hand as often to leave your navigation just to do simple functions such as shift and esc. I would recommend this tool for anyone who is a serious 3d artist. A word of caution though...once you start using it, just be sure to take it everywhere with you or you'll find yourself reaching for something that's not there! I got the Space Navigator as a gift this past Christmas and I love it. So much so that I've used it enough to realize I'm going to need the SpaceMouse Pro because to it's configurable buttons. Whats funny is that I never gave these tools much thought other than to dismiss them as a workflow hindrance. Man, was I wrong. Sounds tempting, I already have the space navigator and am afraid to get to used to something that might not be available at diferent work locations. I would think that especially for freelancers this might become a problem and keeping the workflow as common and standard as possible is the aim. but tempting none the less.